I hope you enjoyed watching the pictures. Its always good to hear from people what they think so please do leave a comment at the bottom of the page to let me know your thoughts. Prior to today, I had never been to a carnival, but pictures from Rio always used to make me wonder when I would get a chance to take pictures at a carnival. When I heard Copenhagen had its own annual carnival, I jumped at the opportunity to photograph this wonderful festival of colour, dance and music. The Copenhagen Carnival is an annual carnival event taking place in Fælledparken and on the streets of Copenhagen, for three days (Friday-Sunday) during the Whitsun Holiday. 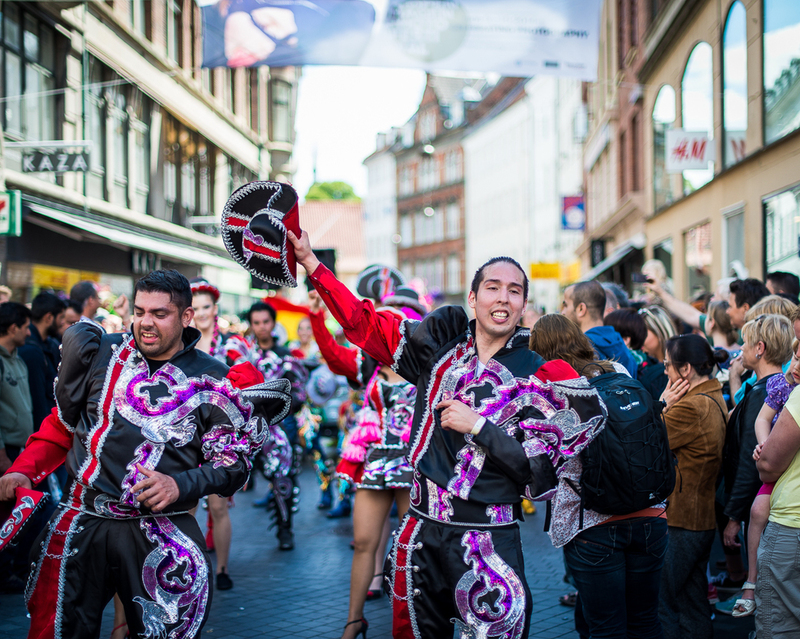 Over the years it has developed into the largest Danish festival for World music with 120 bands, 2000 dancers and more than 100,000 spectators participating. (Source: Wikipedia.org) The main Copenhagen Carnival Parade takes place on Saturday, moving from Kongens Nytorv to The City Hall Square along the pedestrian street Strøget. The day after, the parade is repeated in Fælledparken, leading up to the final evening of celebrations. This saturday I planned to be in Stroget to witness the parade as it moved through the pedestrian streets in all its glory and take pictures of the lovely people in colourful costumes. Following are some of the pictures that I captured of this fun-filled extravaganza. People from all walks of life participate in the Carnival and make it such a fun filled event. Moms with their kids, To-Be Moms, Teachers, Grandmas - everyone participates in this festival, wearing beautiful colourful costumes making it a photographers delight. I hope you liked looking at these pictures. I would love to hear from you how you felt about them, so don't forget to leave a comment below. Please note: All pictures are a copyright of Debabrata Ray and any form of copying, reproduction or unauthorised use without prior explicit permission, is strictly prohibited. It is ironic when you set out to create a picture with a set idea in mind, circumstances force you to stop, rethink and improvise - yes isn't that the norm with life. Life throws surprises at us and we just need to pause, rethink, and improvise on the situation at hand. Coming back to pictures, I had set out today to test out my newly acquired long-exposure gear. It was overcast & raining since morning and I thought this was the opportune moment to get some long exposures. There was movement in the clouds and the light was just right. I waited for the rain to stop - went out as soon as it did and got to my spot. I was looking around finding that perfect composition and spot for my long exposure shot, when it started to drizzle again. I was visiting the area near Christiansborg Palace, which has the canals of Copenhagen. I didn't want to risk my gear getting wet in the rain - especially the 10 stop filter, so I thought might as well make the most of the situation and take pictures of the area surrounding the Christiansborg palace. Here are the pictures I took. Long exposure - for some other day! I hope you enjoyed looking at these pictures. If you did, go ahead and leave a comment below. Please note all pictures are copyright Debabrata Ray. In case you would like to use any of these pictures, please write to debabrata.ray@gmail.com. High resolution prints of these pictures are available as well, please write to me at the email address above for more details. I went to Hamburg during the Easter holidays. Hamburg is not too far from Copenhagen. Actually Denmark and Germany are neighbours, if for a minute you forget about the Baltic sea in between. The trip had a lot of "first in my life" experiences - for e.g. the entire train getting into a ferry to cross the Baltic sea into Germany, besides this being my first ever trip to Germany in itself. While this was more of a family oriented trip, I did take my camera along and took some pictures of the bustling city of Hamburg and the serene quaint little town of Schwerin - which is just an hours drive from Hamburg towards Berlin. In this series below I present to you the pictures I took in Hamburg and Schwerin. I hope you enjoy them and if you do - please do leave a comment below and let me know! One of the 4 days was spent in the scenic quaint town of Schwerin; an hours drive from Hamburg. This trip to Hamburg and Schwerin was one of the best holidays I've had in a while. I fell in love with both the cities I visited. I hope you loved looking through the pictures as much as I loved taking them. All the pictures above are available as high quality prints to adorn the walls of your house. In case you're interested, please write to me at debabrata.ray@gmail.com for more information on prices and print sizes. Please note: All pictures are the copyright of Debabrata Ray and any form of copying, reproduction or use is strictly prohibited without the explicit written consent from the author. This week, I have pictures from a beautiful star shaped park named Kastellet. This place is a 5 minute walk from the Osterport train station and is set amidst beautiful greenery within the city. Now a little bit of a history about this place. Kastellet is one of the best preserved star fortresses in Northern Europe. It is constructed in the form of a pentagram with bastions at its corners. Kastellet was continuous with the ring of bastioned ramparts which used to encircle Copenhagen but of which only the ramparts of Christianshavn remain today. I hope you liked the pictures. If you did - please do feel free to leave a comment below. In case you would like to use any of these pictures / order prints, please write to me at debabrata.ray@gmail.com. Cheers!